On the 3rd of April 2019, the workers of Athens, as well as trade unionists from all over the world, honoured the militant 20th anniversary of the founding of the All-workers Militant Front (PAME) with their mass participation in the event which took place in Kaisariani. 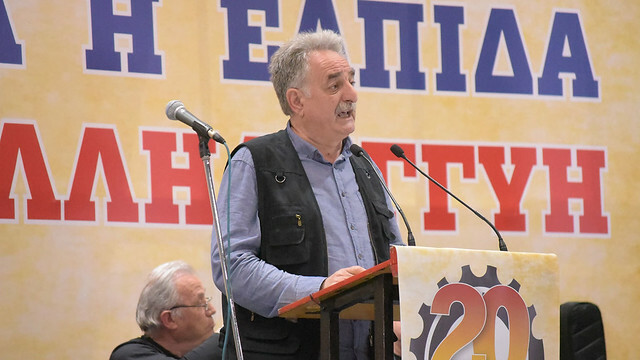 Giorgos Perros, head of the Executive Secretariat of PAME, made the central speech, while messages of greetings were delivered by trade unionists from other countries, members of the Presidential Council of the WFTU. G. Perros noted amongst other things that "the basic legacy of the PAME's activity is the highlighting of the two lines in the trade union movement. The highlighting of the need for militant, mass, workers' trade unions. Trade unions that will fight for the rights of the workers against the employers and their mechanisms inside the trade union movement. Trade unions that will struggle so that the peoples live without poverty, unemployment and wars." The cadre of PAME, in reference to the efforts of the majority of the General Federation of Greek Workers (GSEE), where the forces of PAME are in the 2nd position, to organize an illegitimate congress, with fake delegates, delegates who are not workers, but businessmen, stressed «The confrontation that is being waged and is escalating in this period against the trade union mafia is a precondition for the regroupment of the labour-trade union movement", adding that "the regroupment of the labour is not just a slogan for us. Regroupment of the movement, without affecting the dominance and the interests of the monopoly groups, without disputing the strategy of the EU, without fighting against the anti-people policies, the employers and their mechanisms, without overturning the correlation of forces in the trade unions cannot exist." It should already be noted that PAME already overturned the mafia machinations for an illegitimate congress in a tourist resort in the city of Kalamata, while from yesterday hundreds of trade unionists of PAME are in the tourist resort of Rhodes in order to prevent the plans of the leadership of GSEE to organize the illegitimate congress there. In a period when the decay of employer and government led trade unionism is increasing, PAME, with its positions, initiatives and activity, seeks to prioritize as the main factor class rallying and the unity of the working class. A large delegation of the CC of the KKE, headed by its General Secretary, Dimitris Koutsoumpas, attended the 20th anniversary event of PAME. In addition the mayors of Kaisariani, Ilias Stamelos, and Petroupoli, Vangelis Simos, attended. Delegations from OGE (Federation of Greek Women), PASEVE (Militant Rally of Self-employed) and MAS (Students Front of Struggle), who had met with PAME in the struggles against the anti-people political line and its consequences, were also present. Messages of greetings were delivered by the representatives of trade unions from Cyprus, Cuba, Syria and South Africa.